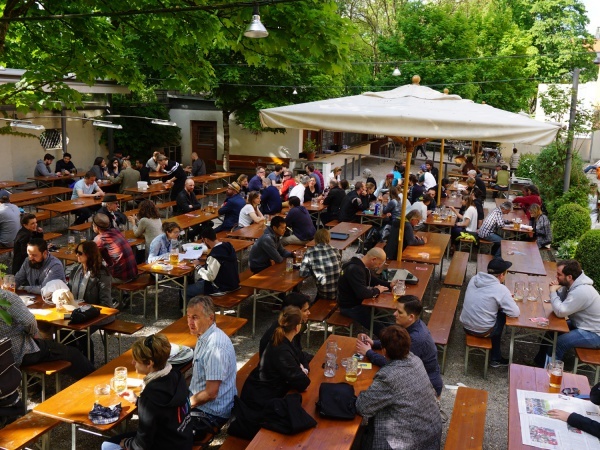 The Muffatwerk beer garden is located in the city centre of Munich next to the Muffatwerk, an old industrial, listed building which is used today for various events and concerts. Just next to the beer garden flows the Isar river, a popular swimming spot throughout the hot summer days. The 70 kilometres non-stop bicycle route from Wolfratshausen to Freising along the Isar passes the beer garden, making Muffatwerk an ideal location for a short break and refreshment. 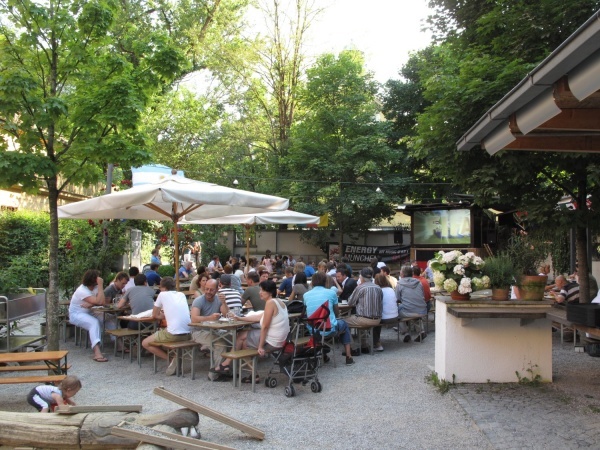 Due to its location, Muffatwerk beer garden attracts mainly a young crowd. The quite new beer garden (opened in 2010) has about 400 seats in the self-serviced area, of which 100 are below a marquee. The food stalls offer exclusively ecological food with meat bought at Herrmannsdorfer, a farm with a butchery 30 kilometres southeast of Munich. The Muffatwerk kitchen combines traditional beer garden meals such as Obatzda and Wurstsalat (sliced sausage salad) with Mediterranean meals. A highlight of the menu is the Lachsforelle (trout) from the Aumühle fish farm prepard in a herbal crust. Every Sunday guests can enjoy a Sunday roast for lunch. All warm meals are freshly prepared at the time of order. The beer served is Hofbräu and a Maß Hell (lager) straight from the barrel costs €7.90 (May 2017). The beer garden also offers a naturally cloudy Ökobier (ecological beer) from Lammsbräu. Beer garden guests can combine their visit with a swim at the neighbouring Müllersche Volksbad. Built in 1900, this indoor swimming pool still shows the Jugendstil architecture in its original beauty. Muffatwerk beer garden is open from April to late autumn, from Monday to Thursday from 3pm and Friday to Sunday from noon till open end. This page was last modified on 18 May 2018, at 19:12.